Image caption Lee Spencer wanted to show "no-one should be defined by disability"
Lee Spencer finished the crossing from mainland Europe to South America in 60 days, breaking the able-bodied record for the route by 36 days. Mr Spencer, 49, from Horrabridge, Devon, said he wanted to prove "no-one should be defined by disability". He became the first disabled person to row from continent to continent. Mr Spencer, who served in the armed forces for 24 years, plotted his epic journey to raise money for the Royal Marines Charity and the Endeavour Fund. 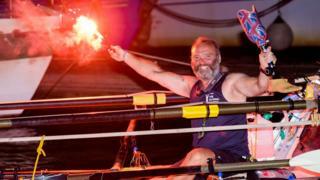 He arrived in Cayenne, French Guiana, at 04:06 GMT (01:06 local time) on Monday, having faced 40ft waves and a bout of gastroenteritis during the voyage, while sleeping for just two hours at a time. The married father of two said he was "exhausted" and looking forward to having a beer and relaxing. Mr Spencer told BBC Radio 4's Today programme he "didn't get much sleep" but "I have done 24 years as a Royal Marine so I am quite used to hardship". Moving around the unstable, tiny boat with one leg was "quite difficult" but that was the "whole point", he added. The former Marine said: "If I can beat a record, an able-bodied record, as a disabled man ... that is the reason why I wanted to do this - to prove that no one should be defined by disability." He set off on the 3,800-mile crossing from Portugal on 9 January but was forced to stop in the Canary Islands to fix his navigation system. The previous able-bodied record for the east to west route was 96 days, 12 hours and 45 minutes, by Stein Hoff in 2002. Mr Spencer encountered whales, dolphins and turtles, and gathered some big-name supporters along the way, including Prince Harry, Ross Kemp and Joanna Lumley - who gave him a goodbye kiss. He said messages of support he had received were humbling and kept him going - with a video from England football manager Gareth Southgate being a particular highlight. "I got told about the video ... and it was one of the first things I watched when I got a signal." Mr Spencer, who completed three tours of Afghanistan and one of Iraq, lost his right leg beneath the knee in 2014 when he was struck by debris from a car engine after he stopped to help an injured motorist. He previously said he was so determined to make the trip in record time he had only taken 90 days' worth of food. 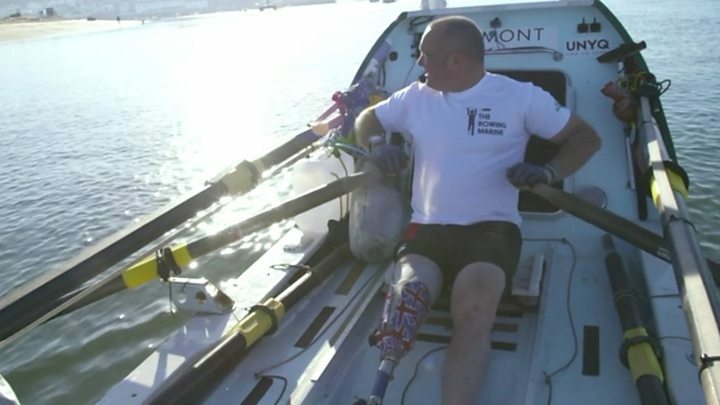 In 2016 Mr Spencer was part of a team of four ex-servicemen who became the first amputees to cross the Atlantic. His "fantastic" individual achievement has been hailed on social media.